More news in from Patrick Coote at Fraser Yachts as he reports that Michael Selter in the San Diego office has seen the price of his central agency for sale, Baglietto’s 39m Bellissima reduced by $2 million to $13.9 million. 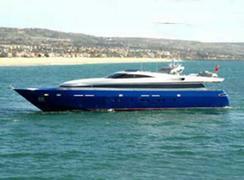 An all-aluminium yacht built in 2004, she accommodates 10 guests in five cabins and cruises at 26 knots. Meanwhile Jose Arana Jr in Fort Lauderdale announces that Mangusta’s 32m Hamsa has come down in price from $3.5 million to $2.95 million. Built in 2000, she sleeps eight guests in four cabins and cruises at 35 knots.